Created for Cream Associates (a marketing consultancy with associates based all over the UK) the CreamCRM (Customer Relationship Manager) has been designed to assist the sales & marketing staff with administering their ever growing contacts database; whilst the CreamForum has been built to assist geographically split teams in communicating across numerous projects. With a host of essential elements built in, the CreamCRM offers the ability to record, track and manage information from basic contact details, to correspondence tracking, to managing in-depth marketing & sales profiling info against each potential and current customer. 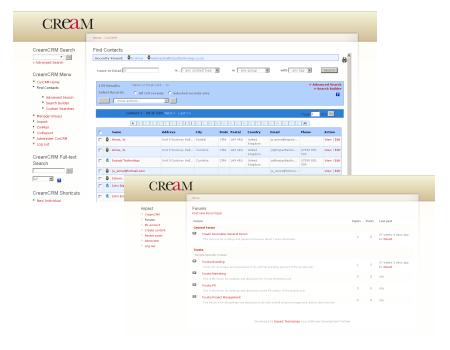 The CreamForum was created to enhance communications between all associates by facilitating a central point of reference for all project related documents, ideas, and discussions. "Impact came highly recommended, and I wasn't disappointed. Their work has more than met our needs and we look forward to continuing to work with them."